Home > Food Facts > Are Avocados Good for You? Slimmers often disparage the humble avocado in the mistaken belief that as it’s a “fatty” food, it has to be bad for you. Right? Wrong. Nothing could be further from the truth. Avocados are not a high-cholesterol vegetable, as many people mistakenly think. In fact, avocados are healthy fruits, which contain no cholesterol at all (only animal products contain cholesterol). They are also a source of all the essential amino acids and contain only monounsaturated fat, which actually speeds up the basal metabolic rate, as opposed to saturated fat, which does the opposite. Help people feel full for longer, due to their high (healthy) fat content. Avocados are rich in oleic acid, an omega-9 fat which is commonly found in olive oil. Most people who find it hard to digest fats find no difficulty in digesting oleic acid. Help people who eat avocados regularly as part of a healthy diet resist the urge to consume fatty foods, as they are already full on healthy avocado fat. Contibute to overall health, as they are rich in vitamins and minerals. Apart from being a slimming aid, avocados also are known for helping to lower blood pressure, and produce healthy, glowing skin. As avocados are rich in Vitamin E, they help prevent the oxidation of bad cholesterol, or LDL, and also contributes to healthy skin. Their high Vitamin E content also means they have been used to boost male fertility and help erectile dysfunction, and treat nervousness, constipation and insomnia. Vitamin B6 is also present in avocados, which helps the central nervous system to function better. A lack of Vitamin B6 has also been linked to chronic fatigue and depression. Additionally, this versatile fruit is full of fibre, potassium and Vitamin A, in the form of beta carotene and beta-cryptoxanthin. This may be of help in reducing the risk of lung cancer, according to some studies. Finally, avocados have been shown in several studies to help increase the absorption of lutein, lycopene, alpha-carotene and beta-carotene in the human body. Lutein can help prevent against the eye disease macular degeneration, among others. Add avocados to a fresh green salad. Sliced up into strips of chunks, they taste delicious with a light dressing, but slice right before eating or they’ll turn brown. Make guacamole. This tasty Mexican dip can easily be made by mixing together a ripe avocado with salt, pepper, fresh lemon or lime juice, a ripe tomato, a dash of chopped coriander and sliced red onion. Fresh chilli is optional. Enjoy avocado on toast. Simply mash a fresh avocado with your fork, then add salt and pepper. Spread thickly on buttered toast – buttered with margarine, that is! Add slices of avocado to a chicken sandwich, or make a veggie sandwich using avocado and tomato. The best way to ripen an avocado is to put it in a paper bag along with an apple, tomato or banana, fold closed and leave overnight. 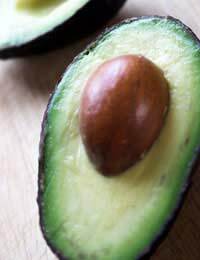 Without another fruit to accompany the avocado, the ripening process will take longer. Avocados are a delicious fruit that can contribute to a healthy diet and help people who are slimming feel fuller. They have a lot less fat than lean beef, and one whole avocado pear is less fatty that three whole tablespoons of many types of processed salad dressing. Enjoy!